The closest decompression chambers to the popular Oriskany dive site and Florida Panhandle Shipwreck Trail are in Mobile, Alabama which is out of state - or in Fort Myers, more than 600 miles away. Although Visit Pensacola promotes the Oriskany dive site and Florida Panhandle Shipwreck Trail, it has not been made aware of the safety concerns rover the region's lack of hyperbaric chambers to treat decompression sickness Nicole Stacey, spokeswoman for Visit Pensacola, told Pensacola News Journal on Thursday. She said Visit Pensacola was not involved in any effort to try to improve emergency treatment options for divers and would rely on the diving industry and those professionals in the area to remedy the situation. The closest hospital to Pensacola that offers hyperbaric chambers for use in dive emergency is Springhill Medical Center in Mobile, Alabama, about 60 miles (100km) away. Within the state of Florida, however, the closest hospital that provides the services is in Fort Myers, more than 600 miles (1000km) away. 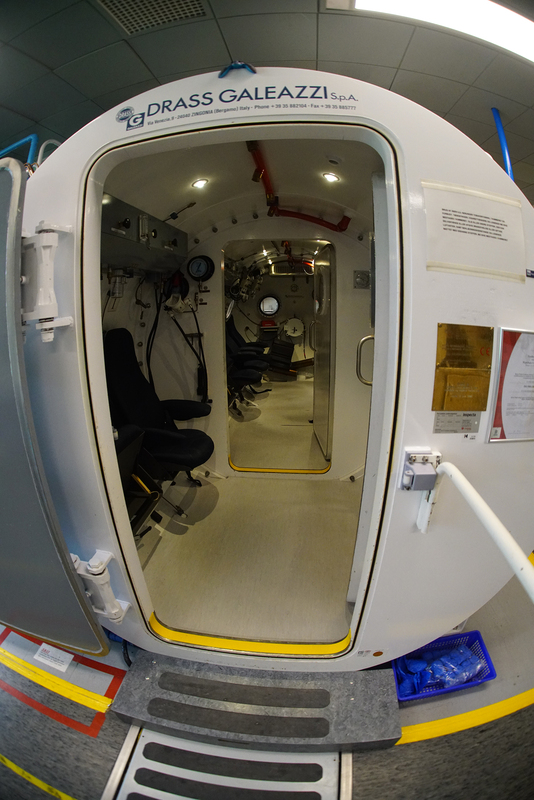 Julio Garcia, director of the Hyperbaric Medicine Program at Springhill Medical Center in Mobile, Alabama, has long warned about the risk Panhandle divers face because they cannot receive timely treatment for decompression sickness, commonly known as the bends. Many hospitals, including some in Pensacola who actually operate hyperbaric chambers, limit their use of their facilities to outpatient wound care and other non-critical treatments stating is too expensive to have chambers, physicians and staff available 24 hours a day, seven days a week for rare dive injuries. The Florida Fish and Wildlife Conservation Commission website urges divers to carefully plan for an Oriskany dive. "Due to its depth, distance from shore, and potential currents, all divers should gain appropriate training equipment, fitness and experience before diving the Oriskany," the website states.